Kevin Stallings was a questionable hire at Pittsburgh from the start. In college basketball, there is always a chance for a coach to save his season and save his job. No matter how tough it is, a late run in March can change perceptions. With the 2017-18 season starting this week, here are five coaches who are in desperate need of a good season. Expectations at Pittsburgh haven’t been this low in decades. Ben Howland isn’t walking through that door and neither is Jamie Dixon — who left for TCU, of all places. Six years ago, the Panthers were a No. 1 seed in the NCAA Tournament. Now, the Panthers are stuck with the thoroughly underwhelming Kevin Stallings. He was a questionable hire from the start. So far, he’s lived down to the expectations. As bad as last season was, this could be even worse. They have no returning starters and 11 new scholarship players. Yikes. Pitt’s new athletic director Heather Lyke has been publicly supportive of Stallings. But declining attendance and losses will change any AD’s mind a hurry. Pittsburgh went from No. 49 in average attendance in 2016 (9,079) to 58 last year (8,327). They were No.33 in 2014 (11,004). Firing a coach in his second season is unfair, impractical and expensive. But Pitt might need to bite the bullet on this one. For Stallings, wins and players’ development are going to be key. If the Panthers are merely bad with no potential all-conference players among their seven freshmen, that might not be enough to save his job. 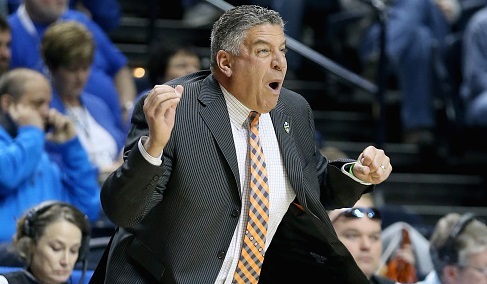 Bruce Pearl is a good coach. He won a Division II national championship at Southern Indiana. He guided Milwaukee to the Sweet 16. He took Tennessee within a game of the 2008 Final Four. But he’s also an incessant hype man and had some NCAA issues. If a second compliance issue cost Hall of Famer Rick Pitino his job, it’s hard to see Pearl surviving long-term with his potential problems (his former assistant coach Chuck Person has been indicted). And it doesn’t help that Auburn hasn’t done much of anything with Pearl in charge. This season could get worse. Auburn’s athletic director just announced he is stepping down. The Tigers lost an exhibition game to a Division II school. Yes, they were playing without its two best players who are out indefinitely due to the FBI probe into college basketball. All of this could be just greasing the skids for Pearl’s departure. Did your favorite team (coached by Bruce Pearl) just lose their first exhibition basketball game to a D-II school at home? Pearl lost his job at Tennessee for lying to NCAA investigators and was hit with a show cause penalty that rendered him unhireable in the college ranks for three years. Once that was over, he immediately landed at Auburn but results haven’t been as good. Last year was his first winning record. If Auburn fails to improve significant, Pearl might find himself back on TV instead of coaching. There are certain schools where you can’t understand why they aren’t successful, based primarily on proximity to basketball talent. Northwestern, near Chicago, had been a punch line until making the NCAA Tournament for the first time last season. Rutgers, near New York City, has been hopeless and hapless. And then there is Georgia, just a stone’s throw from Atlanta. How can the Bulldogs be this dysfunctional? This isn’t necessarily about coaching. But whoever works there has to connect with the AAU scene in Atlanta – and that has its own distinct challenges. The most successful coach in Athens over the past two decades was Tubby Smith (45-19). Since then, there hasn’t been much to cheer for. Mark Fox is the longest tenured coach since Hugh Durham (17 seasons). Fox might be a decent coach, but he might be reaching his expiration date in Athens. The most amount of wins he has had there is 21 – and that was in his second year. The Bulldogs have reached the NCAA Tournament twice. Missing out on a NCAA trip for the third straight season might spell his doom. When it comes to bad basketball jobs, Nebraska is near the top of the list. It was tough when the Huskers were in the Big 12 and it hasn’t been any easier in the Big Ten. The program has seven NCAA appearances in its history and has never won an NCAA Tournament game. It’s not surprising that when Tim Miles left Colorado State for this job, he was coaching on borrowed time. Nebraska was hoping a new conference (joined Big Ten in 2011-12), a new coach (Miles hired in 2012) and a new area (Pinnacle Bank Arena opened in 2013) would change its basketball fortunes. Nope. It’s still Nebraska. Miles deserves credit for getting the Huskers to the NCAA Tournament in his second year. And he’s won at Michigan State twice – which few coaches in America have done. But his teams have only enjoyed one winning season. Nebraska has a new athletic director in Bill Moos. That’s not a good sign for Miles. New ADs love to make their own hires. But if Miles can impress, perhaps he can save his job. Don’t think for a moment that the good folks at Clemson weren’t watching with in-state envy while South Carolina made a shocking Final Four run last year. South Carolina had been 4-9 in the NCAA Tournament and hadn’t had a victory since 1973. Clemson is 9-11 all-time in the NCAA with one win since 1998. Brownell has been at Clemson for a while and was lucky that he wasn’t ousted last year. He took the team to the NCAA Tournament in his first year, but that’s it. Last year, the Tigers were 6-12 in the league, but were also unlucky. They were 4-12 in games decided by six points or less with six one-possession ACC defeats. In April, Brownell was given a contract extension through 2021. That’s amazing for a guy whose team blew a 20-point lead in a season-ending loss to Oakland in the NIT. What if Brownell’s team continues to flatline? Well, the buyout is only $1.7 million if he’s fired after this season.